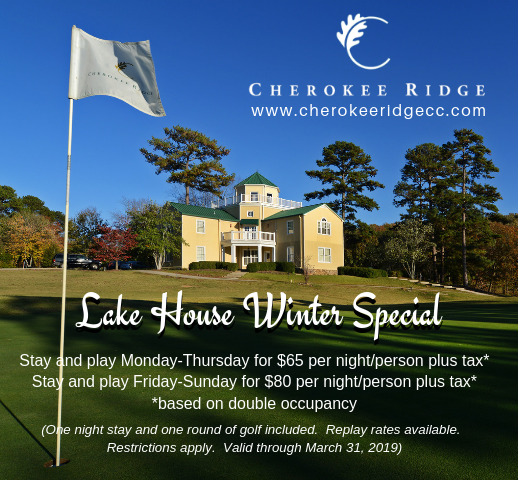 The Lake House at Cherokee Ridge is the perfect spot for weekend getaways, buddy groups and business retreats. Situated high on a knoll overlooking both the golf course and a sparkling 17-acre lake, this lovely Cape Cod-inspired retreat can accommodate 15 to 20 guests. It has 7 large guests rooms on two separate levels. Both residence floors offer access to a great room with overstuffed sofa, a fully equipped kitchen, and all the comforts of home. Hi-Speed wireless internet access is available throughout the Lake House along with a conference room equipped with an overhead screen. 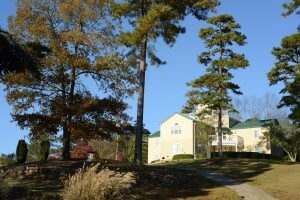 The Lake House provides scenic views of the golf course and plenty of outdoor areas too. The back patio boasts a cozy seating area and BBQ grill. Two large decks enhance enjoyment of the natural surroundings. The front deck allows you to relax in true Southern style, cozied up in a rocking chair overlooking the golf course. The large waterfront deck located on the backside of the house overlooks the 17-acre lake. Private and relaxing, the comfortable style of the Lake House is a charming destination for a weekend getaway, family reunion, business retreat or group gathering.